A somewhat cold and rainy arrival at the Masonic Hall Kirkburton but a warm welcome within and eventually I made my way to the Temple to ensure a grandstand seat to see an interloper, one I had not expected at this meeting. 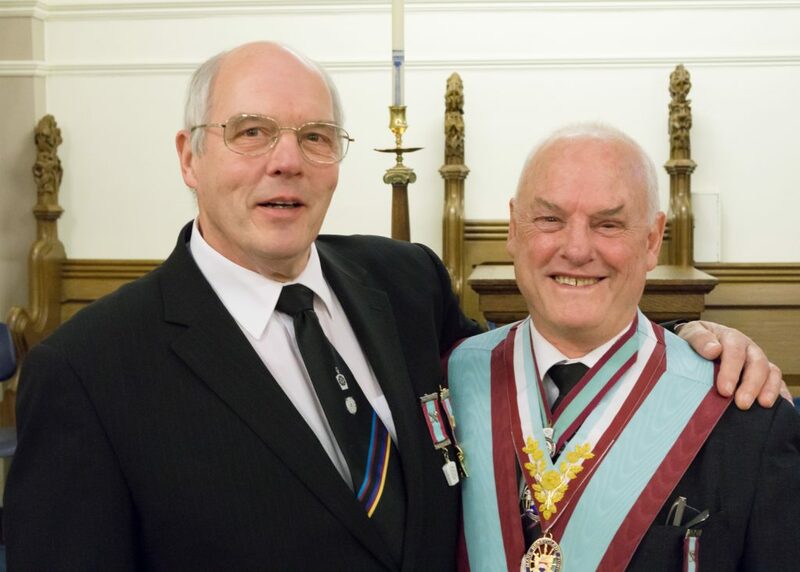 The Deputy Provincial Grand Master, Worshipful Brother Alan Odlfield holding out his hand in greeting having decided to enjoy another delightful Mark meeting. How had he managed to keep this quiet, with the help of an accomplice no less, W.Bro.Ian Booth, the message is clear do not trust Boothy when he books others in, and watch Alan, he has a devious side, still great to see him there. 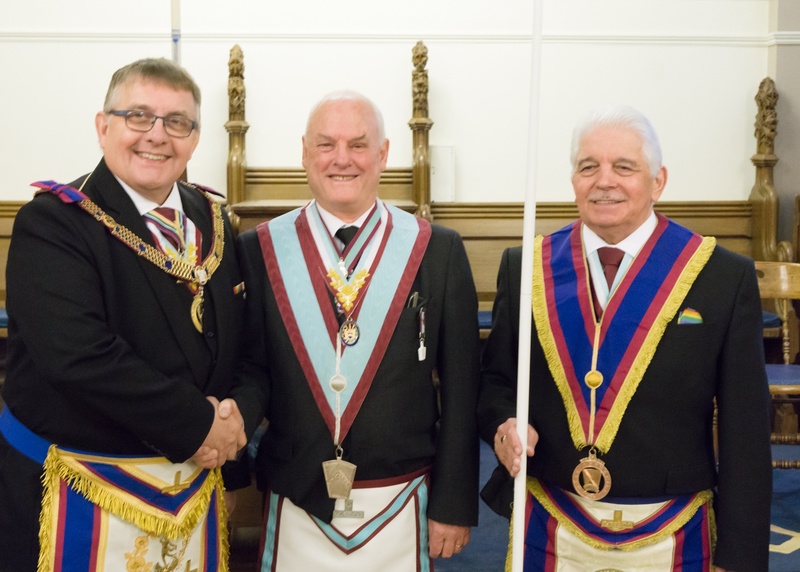 The Worshipful Master, W.Bro.Alan Hampshire, and credit up front to Alan, he has got around and fulfilled one of his key responsibilities of acting as the Ambassador of Beaumont Lodge, he opened the Lodge, minutes confirmed, correspondence read, apologies received, there was a report. 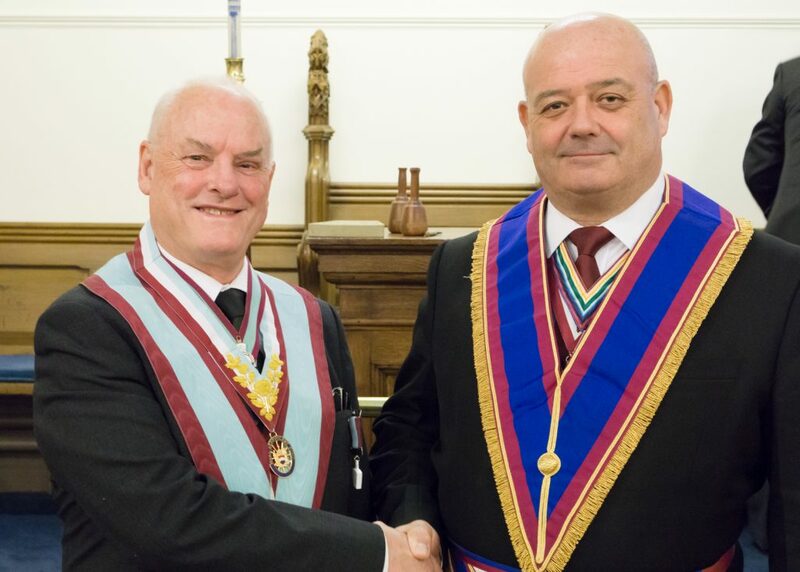 The Asst.Prov.G.D.C., W.Bro.John Gray was admitted and advised that the Provincial Grand Junior Warden, W.Bro.Alex Geddes requested admission, he duly joined the happy throng accompanied by W.Bro.Sam Cariss, Elected Member of the Charity Committee, all systems were now go. 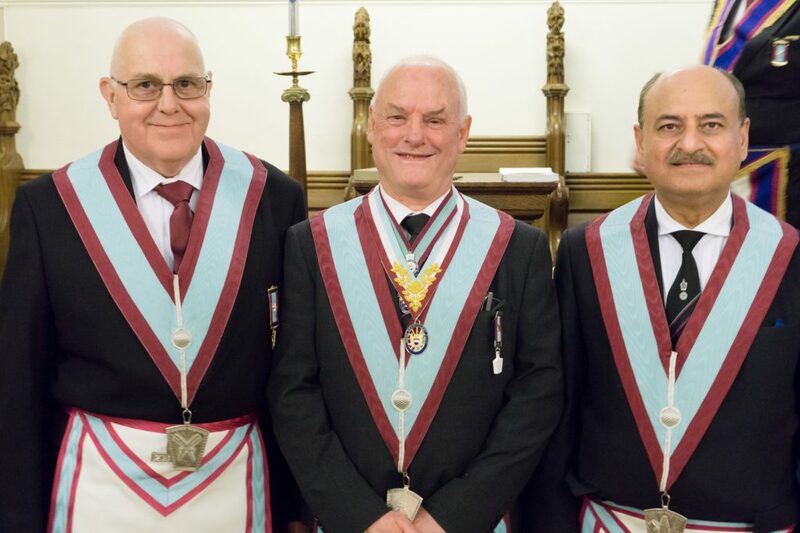 The Master Elect, Brother David Clayton was presented by W.Bro.Gary Parker and W.Bro.Alan posed the necessary qualification questions, all with a positive response. He was then duly obligated, signs and secrets explained, invested with the Collar and Jewel and installed in the Chair of Beaumont Lodge. Whilst W.Bro.Alan was a little hesitant, perhaps a touch of nerves, he can be very satisfied with a task sincerely completed. The remaining agenda items duly despatched, the Lodge was closed. The Festive Board was soup, followed by a delicious Roast Beef dinner and a welcome Cheese board to conclude, others had a sponge pudding, I continue to watch my weight!!. 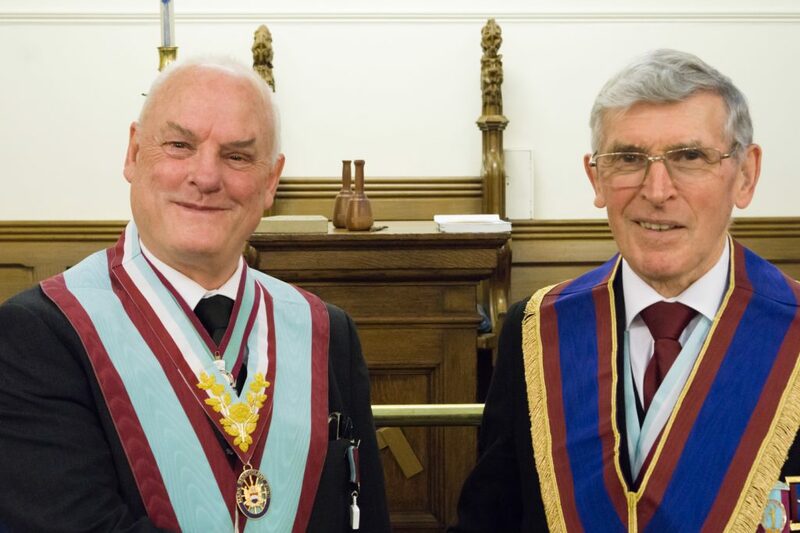 It was left to Worshipful Brother Peter Richmond to propose the Toast to the Province and began by expressing thanks to the Provincial Officers of the Lodge who, in his time had provided grateful advice and assistance. He trusted that in due time he would share the same experience. 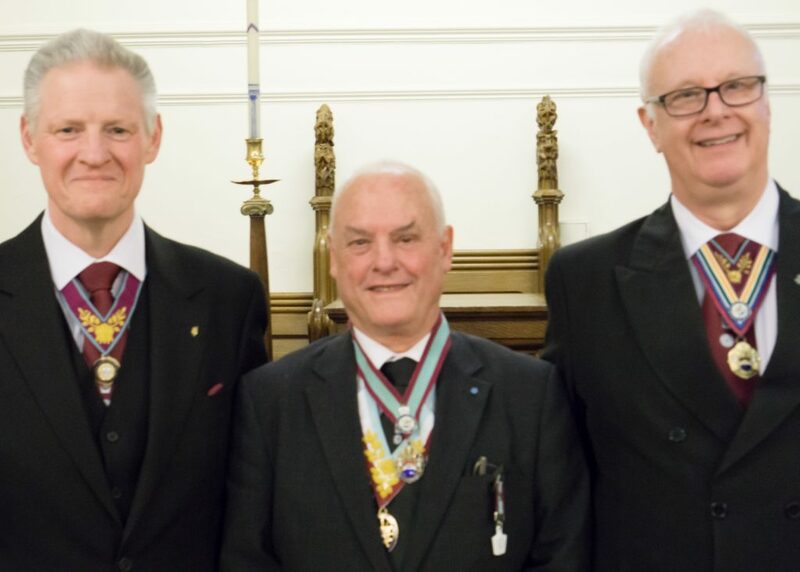 W.Bro.Alex in response brought the thanks of the Provincial Grand Master to all Secretaries, Charity Stewards, D.C.’s and Almoners without which the Province would not function. Attention was then drawn to the Ancient and Honourable Fraternity of Royal Ark Mariners, this being an extension of the Mark Degree. Most provinces enjoy joint membership of the order of 60%, we lag behind at 40%. Very difficult to understand the reasons, R.A.M. has a wonderful story and teachings to tell, speak to one of the members in your own Lodge and give it some thought.